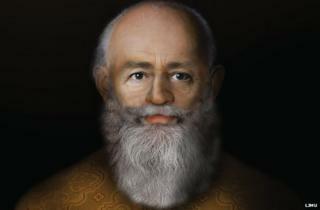 The "most realistic" portrait of the saint who became Santa Claus has been produced at a Liverpool university. Saint Nicholas was a 4th Century bishop who liked to give gifts secretly. His relics lie in Bari Cathedral in Italy. The image of him has been created using a facial reconstruction system and 3D interactive technology by Liverpool John Moores University's Face Lab. Professor Caroline Wilkinson said it was based on "all the skeletal and historical material" available. The saint, who died in 343, was the Greek bishop of Myra. The town, now known as Demre, lies on the southern coast of Turkey. He was said to have left secret gifts, such as putting coins in shoes that were left out for him, leading him to be the model for Father Christmas. A spokeswoman for the university said the new depiction uses "the most up-to-date anatomical standards, Turkish tissue depth data and CGI techniques". It also includes Saint Nicholas' severely broken nose, which she said had "healed asymmetrically, giving him a characteristic nose and rugged facial appearance". Revealing the portrait on the saint's feast day, 6 December, Prof Wilkinson said it was "thrilling to be able to show the face of this famous bishop".